Thursday night: Mostly clear. Lows in the 20s to near 30. Friday: Mostly sunny. Highs around 40. 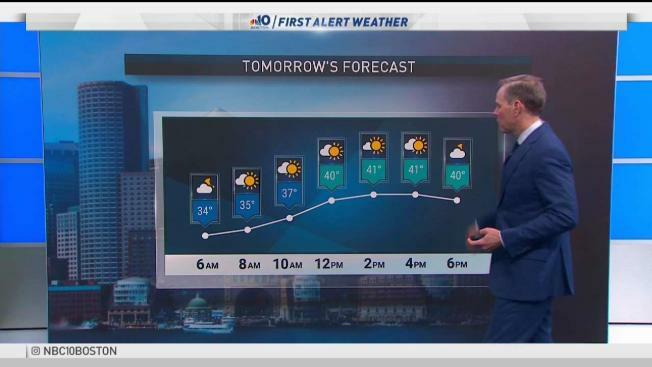 High pressure takes control through early Saturday. This means we will continue to enjoy the slightly warmer than usual temperatures and more sunshine into Friday. Watch for icy patches again tonight, though, as temperatures fall to near or below freezing. Highs Friday afternoon will be in the low 40s across southern New England and in the upper 30s to the north. A bluebird ski day is in the forecast for some slopes Friday with a northwest breeze 10-15 mph and highs in the mid-30s. Saturday will be the drier of the two days this weekend with increasing clouds and highs in the low 40s again. A wintry mix is possible as a warm front lifts through southern New England around midnight and into Sunday morning. Light accumulations of a sleet/snow mix will be possible but a surge of warm air takes over Sunday mid-morning. Southern New England flips to rain with some heavy downpours and rumbles of thunder. Northern Vermont, New Hampshire, and Maine will continue with a sloppy sleet/snow mix. The showers continue south through Sunday evening and slowly move out. Rainfall totals could be either side of an inch during this event. Travel back from school vacation will be better Saturday. A strong area of low pressure tracks north of us, but it will be very deep and that means strong wind. There could be some damaging wind gusts pushing 50 mph Monday, so stay tuned. Decreasing clouds Monday into Tuesday also mean decreasing temperatures from 40 to low 30s. A system brings another round of a wintry mix Wednesday as highs stay in the mid-30s. The jet stream is in a split flow, so disturbances track across the northern U.S. and across the deep south next week. Minor disturbances pass close enough near the northern jet in the forecast guidance that we keep a small chance for a mix in Thursday and Friday. A larger storm moves in Saturday with snow north, rain south. With the split jet stream next week and lack of any blocking, it makes the forecast more uncertain than usual.